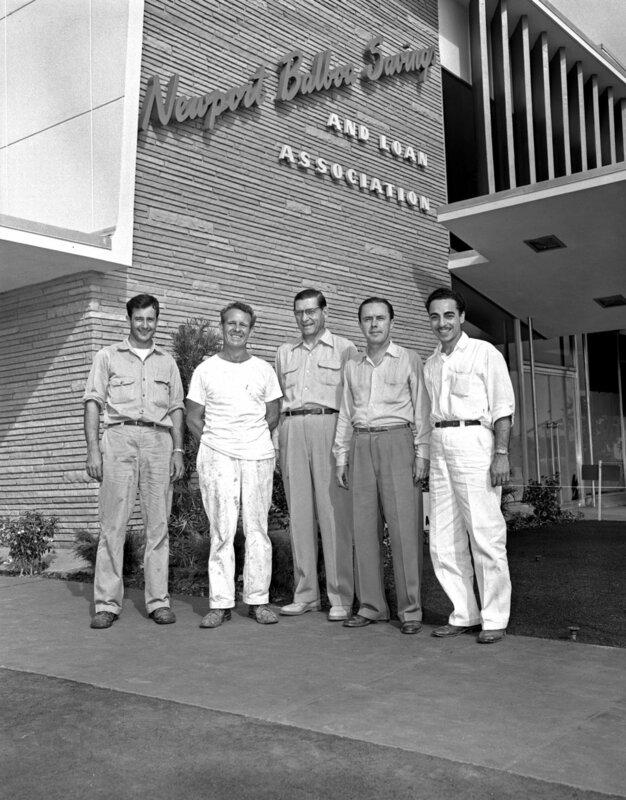 Group representing the Bank Building & Equipment Corp. at Newport Balboa; Sarmiento far right. View at Christmas c. 1961. Visionary businessman Paul Palmer founded Newport Balboa Savings and Loan in 1936. 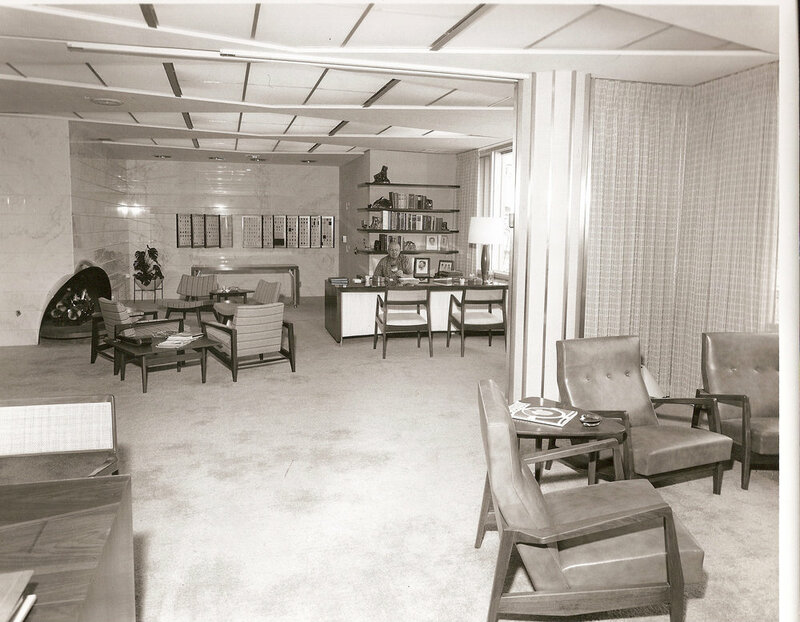 In the post-war boom, his business was flourishing and he needed a new building that could serve his high-style clientele as well as communicate his promising notions for the future. Here is where architect W.A. Sarmiento of the Bank Building & Equipment Corporation enters the picture to create one of the most intriguing, unique bank designs of the decade. 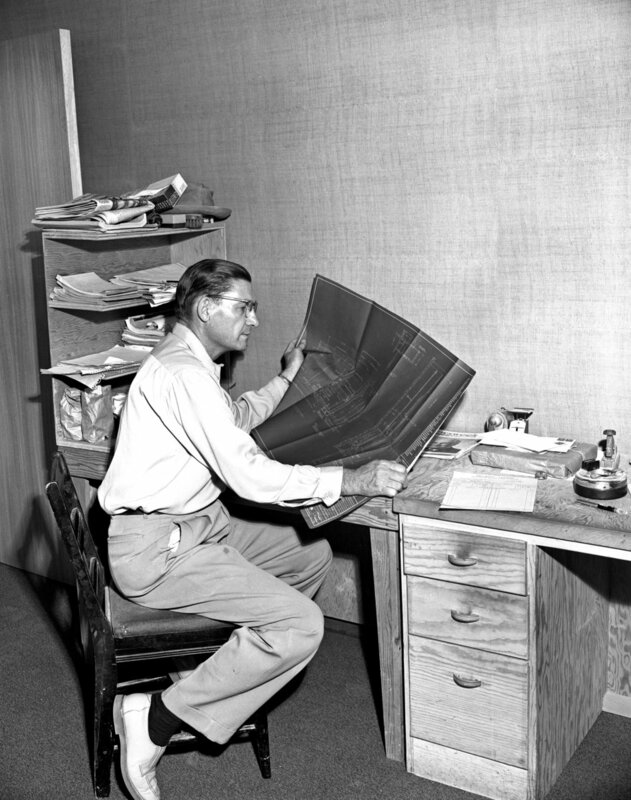 Ed White, a detail-oriented rotating employee of Bank Building & Equipment Corporation, served as Construction Superintendent and according to Sarmiento, executed the design and construction drawings to perfection. Palmer chose a site overlooking Newport Harbor near the bridge to Lido Isle on Balboa Peninsula for his new structure, which was sure to capture attention near this dramatic bay front setting. 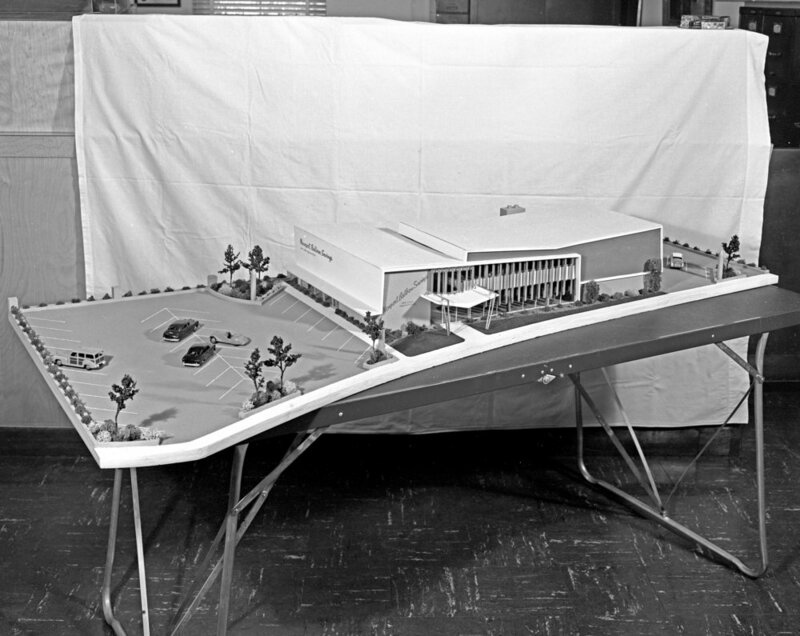 The first phase of construction, a two-story building that has been described as a sea bird returning to safe haven, was completed at an estimated cost of $400,000. Noted architectural Alan Hess has also described Newport Balboa Savings as “a yacht in full sail…a fascinating composition of interlocking rhomboids, which create a butterfly roof.“ The interplay between captivating features and color was a highlight of this building, stretching from the multi-angled roofline, to the mix of blues, greens, and orange found on the fixed louvers. However, the building has been completely white-washed today and the formerly-orange louvers removed. Sarmiento was inspired by the beauty of the bay and its maritime theme. 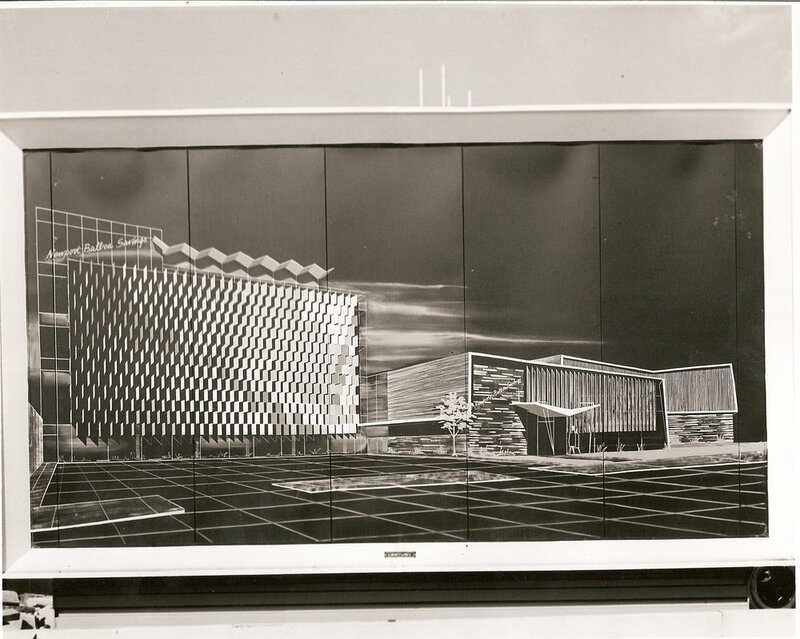 In the Bank Building & Equipment Corporation advertisement that used a photo of the completed building, it promoted that this was the design “to win praise and patronage.” And it must have been because its basic shape was later implemented for the Salinas Valley Savings and Loan <link> in San Jose, California (1962). Sarmiento was contracted later to design the bank’s expansion, which was completed in 1960. 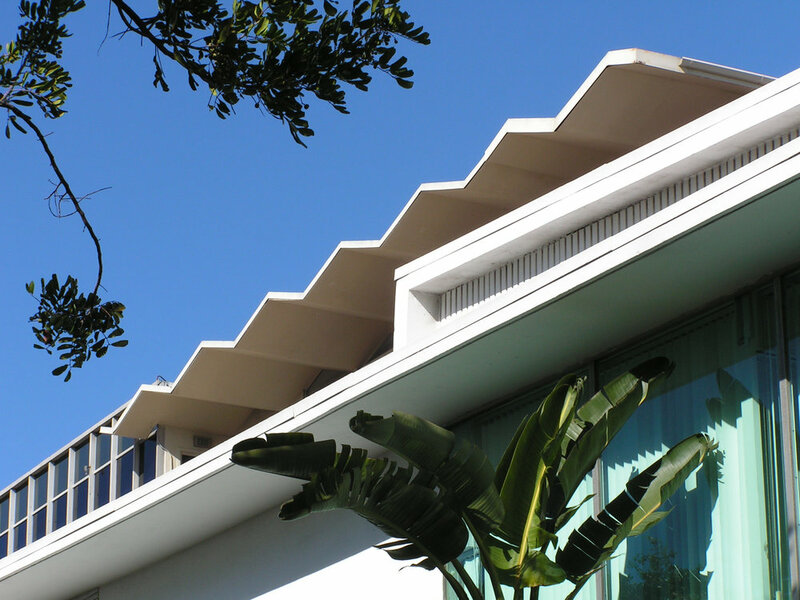 The office building addition added a new compliment of multi-colored sun-shading louvers and a playful folded plate roof as a cap. 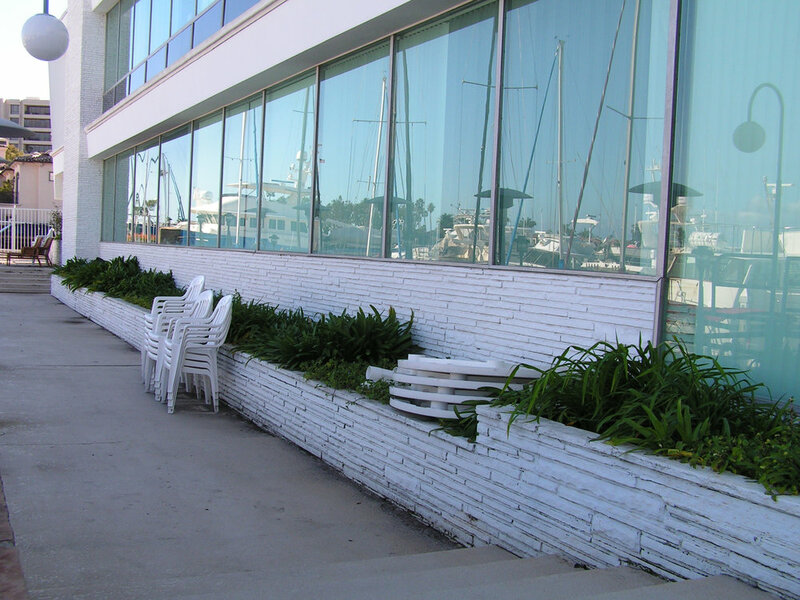 The waving folded plate element signified the location of the rooftop restaurant that was a popular destination for many years with its outstanding view of the Newport Bay. 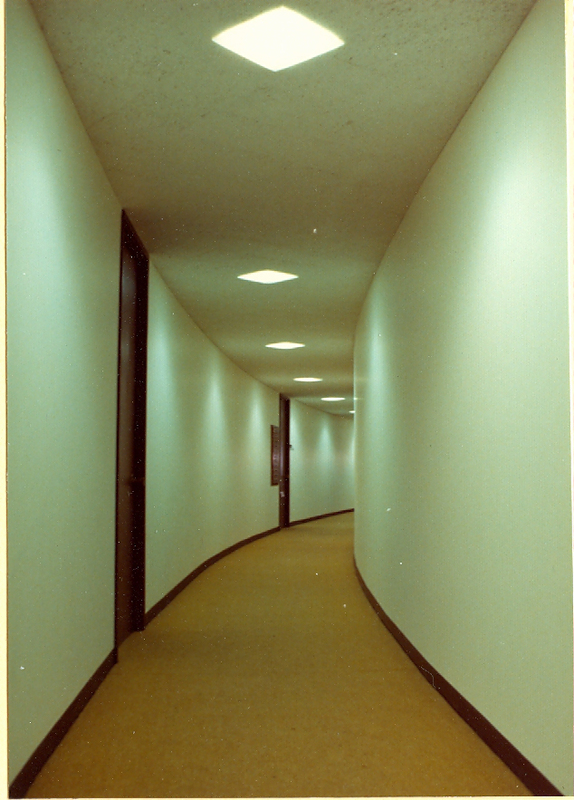 With the addition, Sarmiento also designed a new interior stairway to link the addition’s second floor and the ground floor of the banking building. 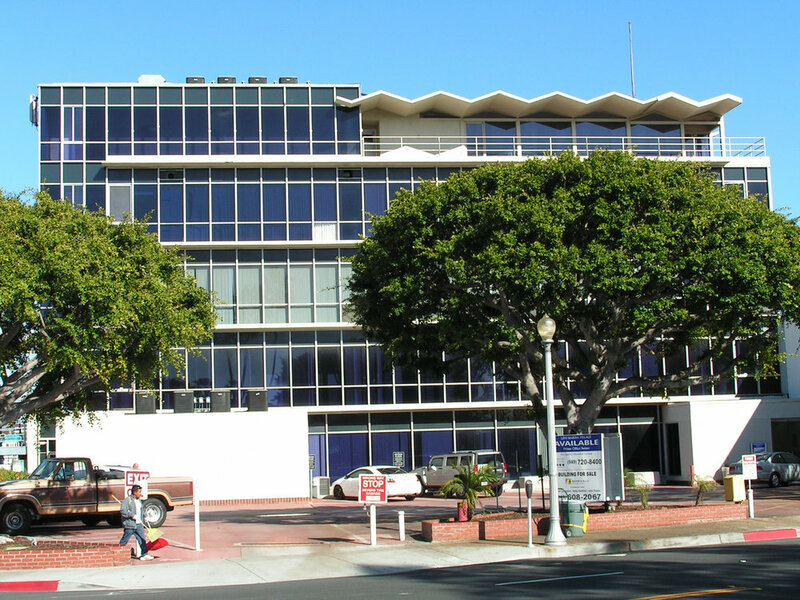 Newport Balboa Savings was said to be the only bank in the country with ‘yacht-in’ banking service, likely to serve its high-class patrons such as the Carnegie family who resided in Newport on both coasts. The building is currently a condominium office complex.